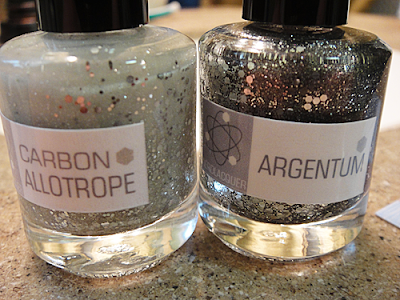 Dollish Polish, NerdLacquer, Pretty & Polished and Ninja Polish - Instahaul! Zebra print and hot pink combo? A girl after my own heart. "Probably one for my personal top 5 movies of all time, The Princess Bride is a timeless love story, with some pretty brilliant comedy and an endless supply of famous quotes. 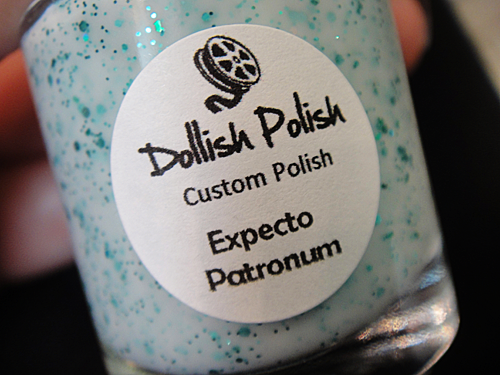 I had a tough time naming this one as a result & may end up doing an entire collection based on this amazing movie. 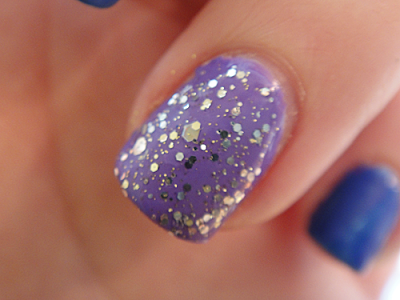 The palest sky blue, with a deeper blue shimmer and flecks of gold glitter is inspired by Buttercup's wedding gown from her flubbed wedding with Prince Humperdinck." "Inspired by Call Of Duty, Modern Warfare, this funky shade is micro fine glitters in black and neon green, accented with medium line green hexagons and larger White hexs with Black squares all in a clear jelly base." If my boyfriend was a girl, he would totally wear this. "My #1 favorite comedy, is all thanks to the legendary Mel Brooks. Combine that with the amazing talents of Gene Wilder, Peter Boyle, Madeline Kahn and many more, make this parody of Frankenstein one of a kind. 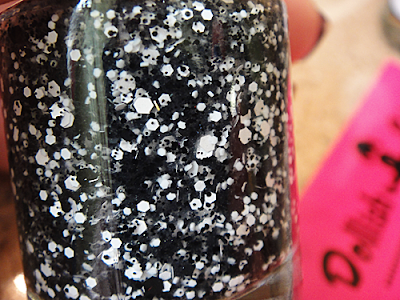 A Black and White glitter polish for one of the best Black and White movies I've ever seen." "This famous spell from the movie "Harry Potter & The Prisoner of Azakaban" which fends off Dementors with a glowing white shield of positive energy when used. 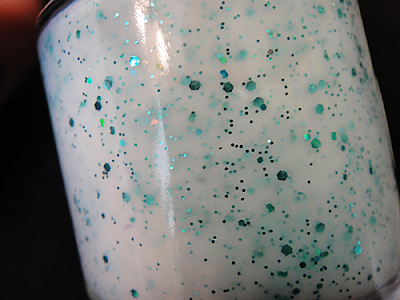 This is a milky white with a hint of Green shimmer, has iridescent flakies and varying size Green glitter." 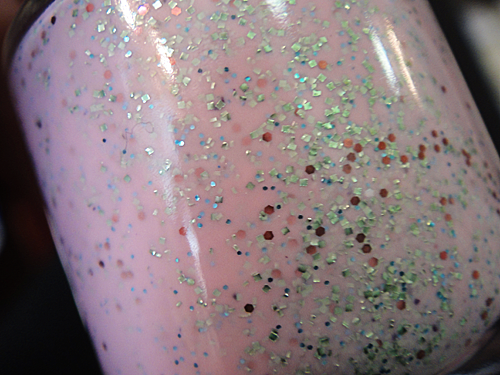 "Celebrate the holiday or just the Spring season with this delicious Cool-tone candy pink shade, with a hint of lavender, loaded with hexagons glitters in Spring Green, Light Blue, and Pink. " 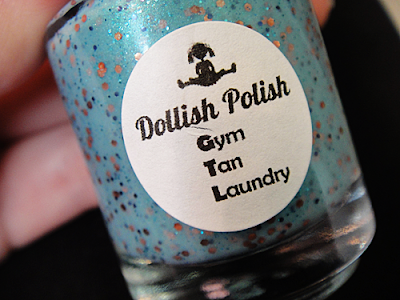 GTL"Aka Gym, Tan, Laundry, from the Jersey Shore hilariously funny daily mantra. Light ocean turquoise with varying shades of blue glitters and larger sandy copper glitters, this shade is inspired by the actual Jersey sea coast." 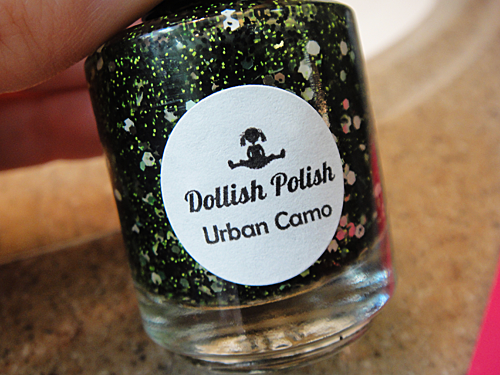 I love this polish so much. 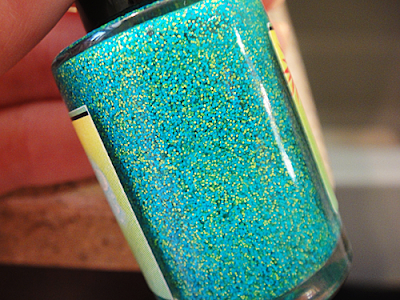 The tan glitters remind me of their, well, tans and the turquoise reminds me of those bright-colored Affliction shirts that the guys wear to out. 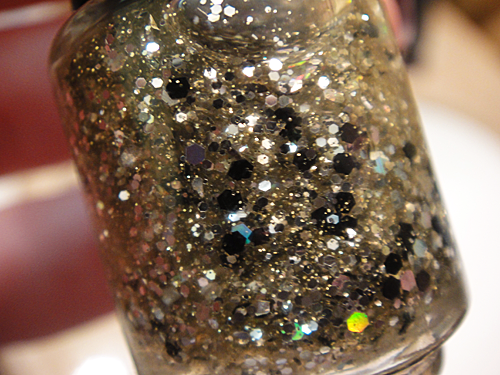 "From the Super Divas 4 piece collection, Put A Ring On It, is inspired by Beyonce and is a fine Gold & Silver glitter and is loaded with medium hexagon glitters in Black, Gold and Silver." UGH. 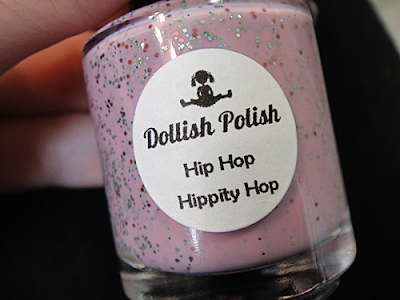 I bought a mini of this thinking, "No, Noelle. You don't need this in full. It's way too crazy for you." I was so, so wrong. It's too crazy in the best way possible. DP needs to open up ASAP. I need this in full. "Put A Ring On It" over Julep's "Anne"
OVERALL THOUGHTS ON DOLLISH POLISH: WOW. Wow, wow, wow. I love the names, I love the formulas, I love everything about every single polish I've bought so far from Dolly. I'm absolutely blown away. I always read how people would just stare at the polishes in amazement and I used to think they were super weird...until I found Dollish Polish. I just kept staring and staring and staring. 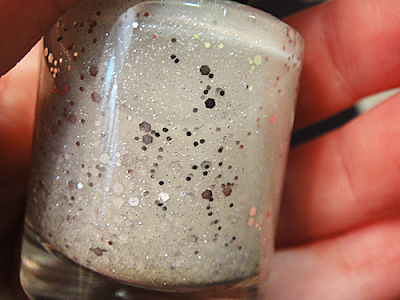 Every single glitter mixed expertly with the right color combinations; this is a girl who's awesome at what she does. This. is.so. cool. 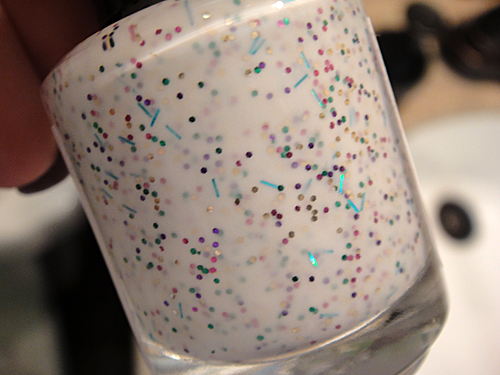 On your nails, it looks like you took Funfetti frosting and painted with it, but in a totally pretty, not crazy way. 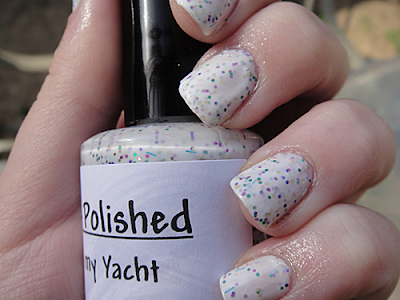 Turquoise bars mixed in with purple, pink, yellow and green glitter set in a liquid frosting white base. YUM! See? Totally looks like frosting. 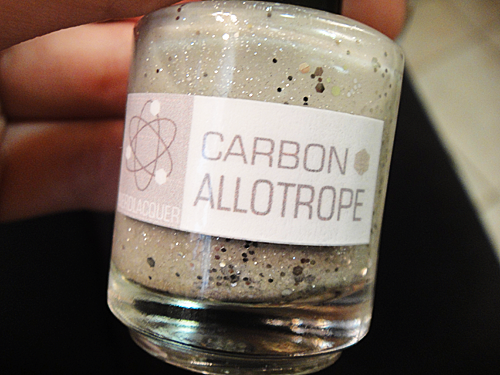 Ignore my slicked-up cuticles. Weather has NOT been kind to them! 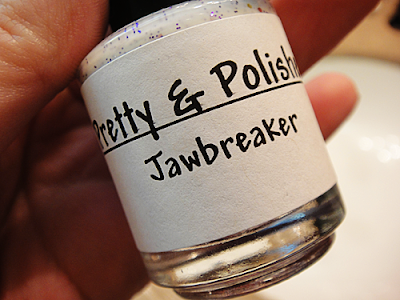 This looks EXACTLY like a Jawbreaker. Couldn't have picked a better name! 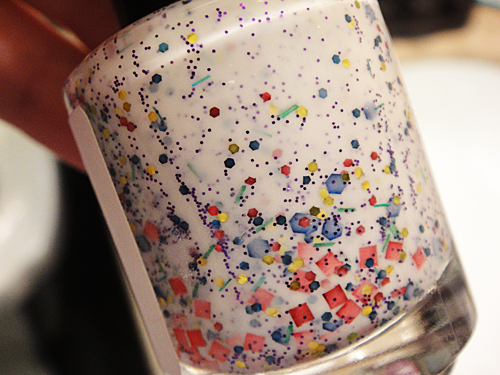 Red squares, blue hexes, yellow, red and blue glitter, purple micro glitter and green bars all tied together in a creamy white base. OVERALL THOUGHTS ON PRETTY & POLISHED: Another serious jaw-dropper. My wallet and I are going to have to have a long talk the next time she opens shop. I feel like I've waited a bajillion years for this. It's only been like, a month but still. AKA. 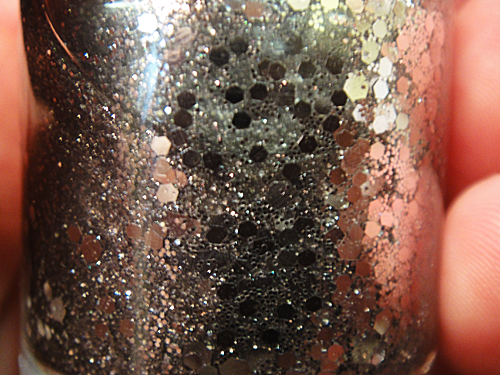 A disco ball in a bottle. Or maybe a silver sequined dress in a bottle. Check out that sparkle! Carbon Allotrope is a clear base with medium silver hex glitter, small silver glitter, and silver and white microglitter. No dyes, no micas, no tints. The silver-sand color comes from two sizes of POWDERED. DIAMOND. 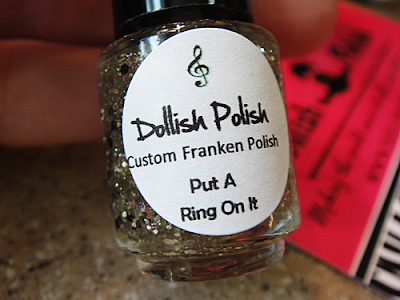 It's synthetic, people, but still, I had to buy it. 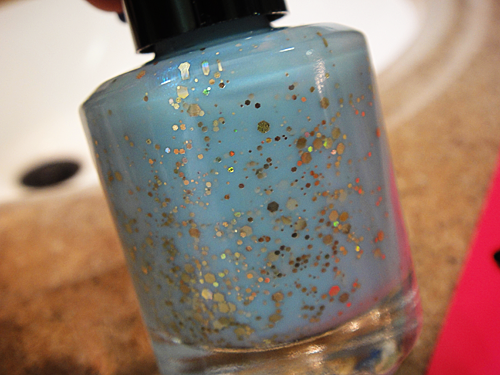 This bottle was a splurge! OVERALL THOUGHTS ON NERDLACQUER: So worth the wait. Holy cow. I can't even right now. 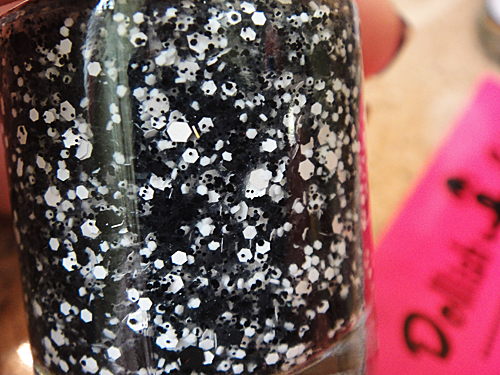 Do you guys see that glitter and shimmer? For the girls that are distracted by shiny things, this is right up their alley. I am so one of those girls! 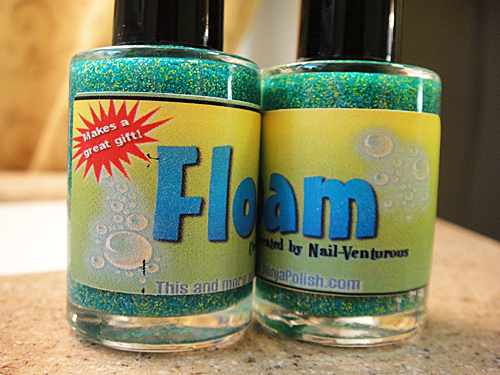 "Floam has matte neon blue and yellow-green fine glitter a clear base. 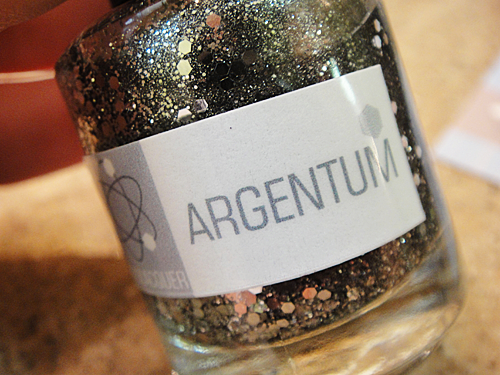 It has complete coverage in two to three coats and can be used as a layering polish with one coat. With topcoat or gelous, Floam can have a shiny finish. 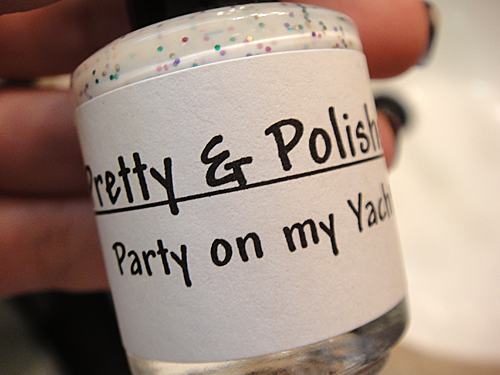 However, this polish dries with a matte finish, and the glitter itself does not sparkle." TOTALLY jealous you have 2 bottles of Floam! I should have done the same. 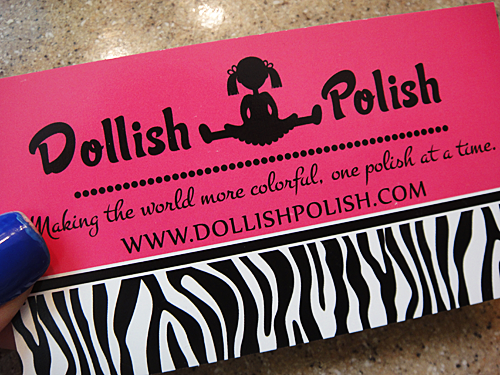 AND did you get a shipping notice from Dollish? I know we ordered the same time & mine just says paid. 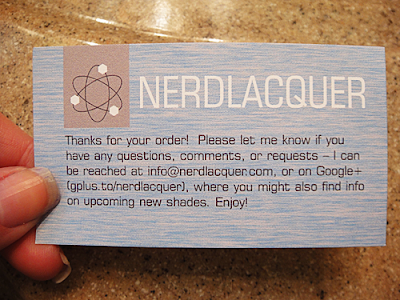 NO, she didn't send me one which is odd because there is clearly a tracking number on the box.